Lumident was founded in 2010 by Dr. Riad Bacho, Dr. Bassel Doughan and Dr. Hani Hasbini. They are all highly qualified specialists with internationally recognized degrees and certificates. They occupy teaching positions at different universities, and are daily practitioners at Lumident. To give you optimal quality of dental care and provide you with a flexible and efficient schedule, they work alongside dental associates who are also experienced and competent specialists in different fields of dentistry and dental surgery. 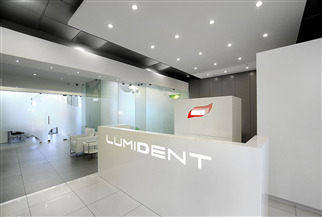 Located in the hub of the capital Beirut, Lumident is a high-end polyclinic that offers comprehensive dental services and follows state-of-the-art technologies and practices. Our team provides your entire family with the finest dental services. We will do everything possible to put you at ease and make your visits quick, efficient and comfortable. Your satisfaction is our goal, and we strive to provide you with a pleasant and painless dental experience that will keep your smile healthy and beautiful! Our mission is to provide our customers with a wide range of high quality dental services that optimize their oral health and beauty. Our vision is to be a leading dental care center recognized for quality customer service, clinical excellence and responsiveness to community needs. • Innovation: We are committed to adopting the latest technologies and procedures relating to dental health. • Safety: We are dedicated to creating a safe and friendly environment for both patients and staff. • Mutual respect: Treat everyone with dignity and respect. Show respect to earn it. • Improvement: Maintain high quality care and foster an environment of continuous quality improvement. • Loyalty to work: Work attentively to serve patients and other stakeholders. Fulfill responsibilities on individual and group levels. • Excellence: Strive to exceed the expectations of those we serve. Avoid mistakes, but be willing to admit them when they happen, and rigorous in correcting them.